Bangkok (Thailand) – December 12, 2018 (travelindex.com) – Gin Mare, the first and authentic Mediterranean Gin, in partnership with B-Delicious and Novotel Bangkok Sukhumvit 20, announced the launch of exclusive Gastromixology competition in Thailand, in partnership with, to discover the perfect food and beverage pairing creations developed by a chef and bartender team in the invited establishments as the selected country to debut the campaign for the first time in Asia. Find out about the best fine dining restaurants in Bangkok and Asia at Top 25 Restaurants, the Mastercard Affluent Dining Guide by Travelindex and the trusted Restaurant Rating Index? ‘Gastromixology Sessions’ by Gin Mare aims to unite gastronomy and cocktails under one concept by selecting and inviting ten of Bangkok’s top tier of restaurants to express their interpretation and vision of the Mediterranean in a food and cocktail pairing under concept “Mare Nostrum”, which represents the Brand Values of “Lifestyle, gastronomy, climate and the unique feeling of escape” using Gin Mare as the highlight ingredient in the food and beverage pairing creation. During the period of December 3 to December 23, 2018 contestants will showcase their creations at their respective restaurants for the panel of judges to visit and taste, as well as commercial sales for broader audiences. – Sky on 20, Rooftop with cocktails, craft beers, wines and tapas. Upon the completion of the timeline, the winning contestant will be announced, and there will be an award ceremony in which participants will introduce their pairings. The panel of judges which include; Chef Andy Yang Michelin Star New York 2010 and Bib Gourmand Bangkok 2019, Sven Van Coillie from Gault & Millau Belux, Kanokwan Asawanuchit from Fashion On Food by Ching and owner ‘Rod-Saneh’ restaurant, the gin master of Thailand and owner of ‘Teens of Thailand’ gin bar Niks Anuman-Rajadhon and Enzo Comes, Gin Mare Global Brand Ambassador will score the pairings based on the following criteria: Inspiration, explanation, presentation, appearance, flavor, aroma, harmony of the ingredients and final result of the pairing. The prize will be a trip to attend the Asia’s 50 Best Restaurants that will be held in Macau, where Gin Mare is the official gin partner. The act of inventing cocktail recipes is an art in its own right and has over the years gained the attention of the food and beverage industry on a global scale as these concoctions have become more refined and more exquisite than ever before. Cocktails are no longer just made to be enjoyed on their own but made to be part of a meal and be enjoyed with food. The skillset and the ideas that go into making these modern cocktails have broadened and has redefined mixology across the globe. In recognizing this Gin Mare, the first and authentic Mediterranean Gin, has launched ‘Gastromixology Sessions’, a global campaign called in honor of celebrating the incredible experience that surrounds tasting food with cocktails. The restaurants chosen are those that the brand think will be able to support their objectives in demonstrating how out of the ordinary and incredible pairing food with cocktails can be. The campaign has already been successfully launched on another continents, notably in Spain and Mexico. Gin Mare has played an invaluable role in the development of the gastromixology trend over the years with several initiatives done to highlight the incredible properties that their gin boasts and all of the different ways it can be used for both mixology and culinary purposes. Other campaigns have included collaborations with world renowned chefs, such as Angel León, the Adriá brothers and others, all in a bid to demonstrate the incredible experiences that can be had in pairing cocktails with food tastings. Gin Mare, the first and authentic Mediterranean Gin is produced with the best of select botanicals from the Mediterranean Sea basin – Arbequina Olive, thyme, rosemary and basil. 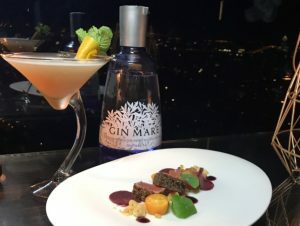 Given its unique and aromatic characteristics, Gin Mare is recognized as the leading brand among the Food and Beverage sector, while the special recipes distributed throughout the world through Gin Mare ambassadors are widely loved in all settings. B-Delicious, Thailand’s leading importer and distributor of premium range of beers, spirits, tonic waters, and artesian waters from around the globe to Thailand’s world-class hospitality and retail sector. The team is committed promoting the responsible enjoyment of their products.